In a one-page memo to employees, the company provided a list of responses that employees were asked to read if they were asked any questions. While the initial public offering of Xiaomi Corp. didn't go quite as scripted, the same cannot be said of the company's employees. The giant Chinese smartphone maker, which completed its disappointing IPO in Hong Kong on Monday, made sure its workers knew precisely what to say if anyone asked. In a one-page memo to employees, the company provided a list of responses that employees were asked to read if they were asked any questions. 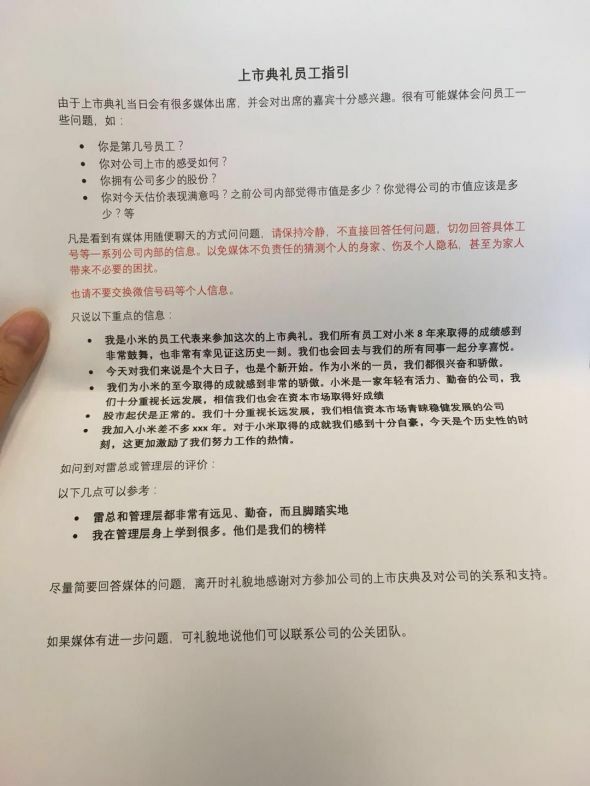 And in an unusual display of transparency, the printed version was then left at the reception desk where reporters signed in for the company's press conference in Hong Kong. 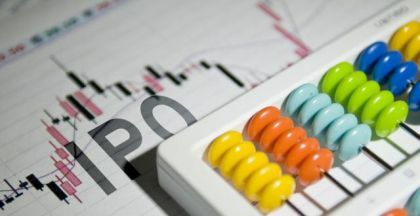 Titled "Employee Guidelines for the IPO Ceremony," the list included five prepared responses for questions about employees' feelings regarding the company and two responses about the company's top management. "I work for Xiaomi and I am here to attend the IPO ceremony. All of us are so proud of what Xiaomi achieved over the past 8 years. I am so lucky to witness this big moment," one of the company's scripted responses said. After pricing 2.18 billion shares at HK $17 ($2.17) per share, the low end of its expected range, Xiaomi (1810.HK) dropped quickly to HK $16 per share. 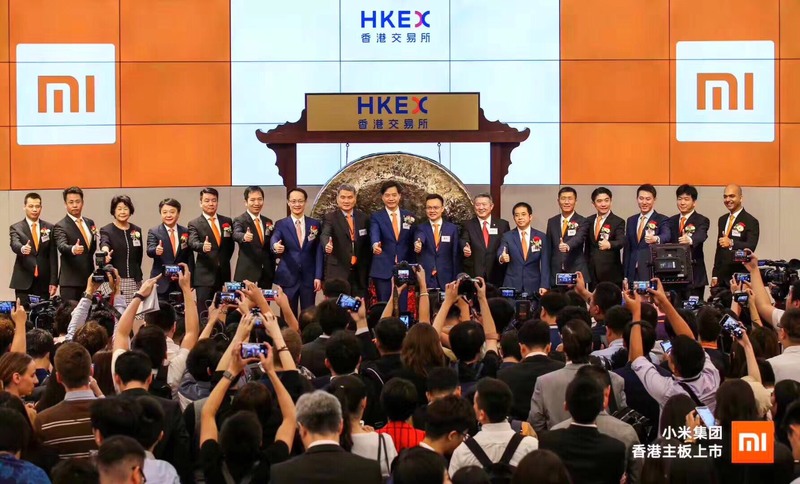 It climbed most of the day but could not regain its IPO level, closing at HK $16.80 per share. For Xiaomi, as well as the overall tech industry in China, it was a disappointing signal of lagging investor appetite for new issuances. 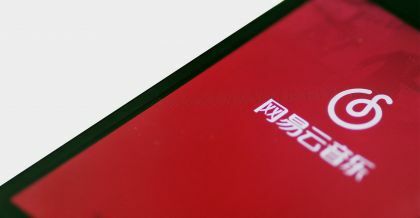 Although the largest offering by a technology company in four years, Xiaomi had originally been hoping to attract as much as HK $22 per share in its planned float of about 2.18 billion shares. Under its original plan, Xiaomi's valuation could have hit as much as $100 billion. Instead, the current valuation of $46 billion essentially means the company's value remains unchanged from its last fundraising round in 2014. "Today is a historical moment, and it will motivate us to work harder." 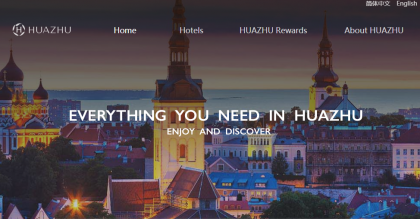 "Our CEO Mr. Lei and the management are visionary, hardworking people and they are also down to earth." "I learned a lot from the management and they are our role models." "Stock fluctuation is normal. We value the company's long-term development and we believe that the capital market will like a promising company like Xiaomi."